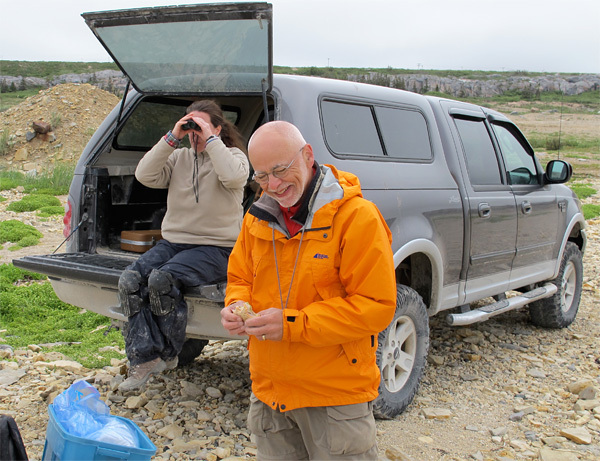 Debbie Thompson and Dave Rudkin, at lunchtime during Churchill fieldwork in summer 2011. Debbie is not using the binoculars to look for fossils: she is watching polar bears a kilometre away on the tidal flat. I have heard several paleontologists state the maxim that you should always look for fossils in the exact spot you have chosen to have lunch. And there is some truth in this: I recall many years ago relaxing after lunch on top of a Silurian reef on the coast of the Gaspé Peninsula, pulling trilobite after trilobite from the gravel I was resting on. 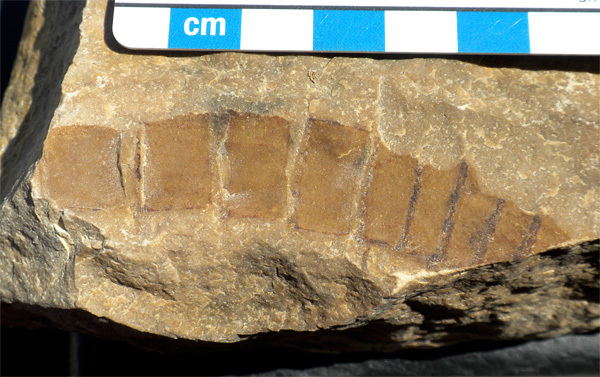 Similarly, last summer I found one of the most complete Ordovician eurypterid specimens at Airport Cove just below my seat on the slope, without having to move at all from where I had consumed my sandwich. Why should this be? Are we supernaturally drawn to eat at those places that hold the secrets we seek? This seems very unlikely. Rather, it is probably related to the fact that we look with “different eyes” when we are relaxed, yet those eyes still hold the image of what we seek. I was thinking of this as I walked to the bus this afternoon; it was the same old neighbourhood, but add a layer of snow and take a slightly different route, and you will see many things that you have not observed before. The other critical factor with lunchtime discoveries is that lunch provides an opportunity to look intensely at everything that can be seen in one tiny area. 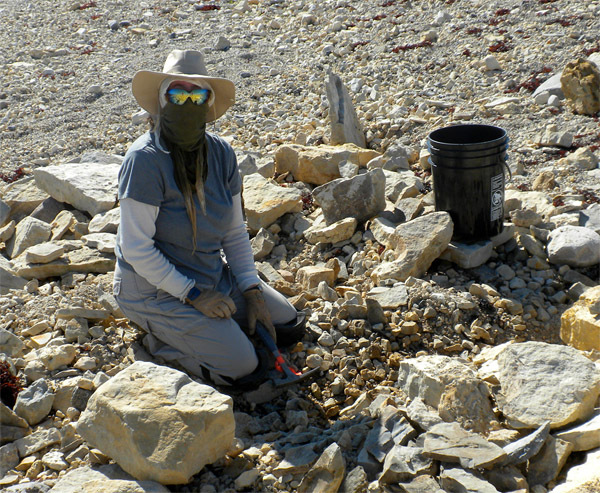 The entire fossil-collecting site may not be all that large, but we are still unlikely to see all the details if we are considering the site as a whole. It is far too easy for a place to become so familiar that we walk over it daily without ever seeing what is under our feet. I still find it shocking that the Airport Cove soft-tissue biota lurked for years right beside where we parked the truck, as we went to collect fossils such as trilobites and corals farther down the shore. Considering mineral exploration across the huge expanse of northern Ontario, it is also surprising that the immensely rich Hemlo gold deposit was not found in some unknown place far from human activity. Rather, it was in easy sight of where the Trans Canada Highway had been pushed through many years before. It is for these sorts of reasons that I don’t find it the least bit restrictive to do research at a provincial museum. I might sometimes envy university colleagues as they fly off for fieldwork in India or Australia, but I also think that we are more likely to find unusual things here, because we have the opportunity to contemplate a limited area. Soft-tissue fossils in Konservat-Lagerstätten may be little known and rarely found, but that doesn’t necessarily mean that they are rare. It may just be that we aren’t all that good at finding them! By focusing on smaller areas, we may be more likely to locate the really unusual and significant things. I would not be the least bit surprised if we find one or two more unusual fossil sites in the coming years; we just have to make the time to eat lunch on enough outcrops. 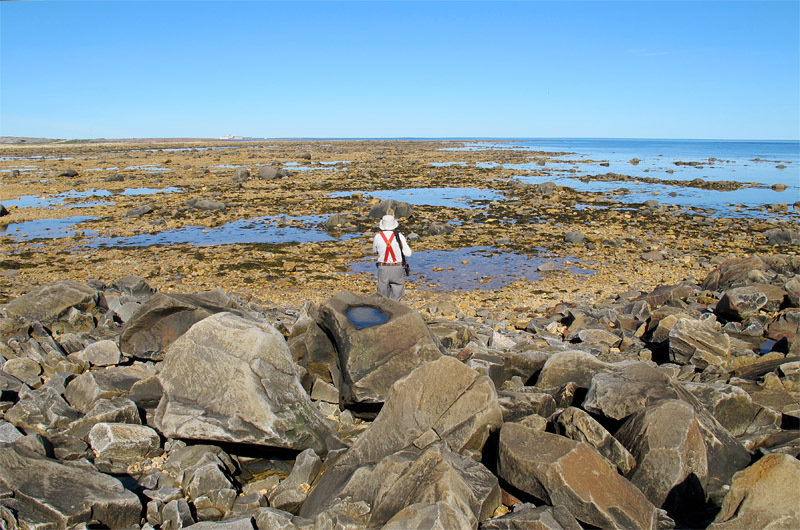 Ed Dobrzanski surveys the expanse of Airport Cove near low tide: it is a challenge to find unusual things in an immense area! Oh Graham, you have sorely tempted me here! My tale begins over 15 years ago in Denver at a Mexican restaurant dining with my buddy from the Denver Museum of Nature and Science, Kirk Johnson, and some of his colleagues. Shall I say we drank a few fermented products? Well, I was quite unwell the next day (must have been the guacamole! ), which was unfortunate as we were driving to the New Mexico border to collect at some Cretaceous-Tertiary boundary sections for fossil plants (why else? ), and maybe the occasional dinosaur trackway. Halfway there, perhaps in deferrence to my uncharacteristic silence and immobility in the van, we stopped for lunch at a well known roadside ammonite locality. I chose to stay at the van while my companions, fruitlessly as it turned out, cracked nodules looking for fossils. Not one fossil was found. As we sat and drank a medicinal cold beer (a cure for what ailed me) and munched our food, I leaned forward and prodded a nodule with my hammer. Feeling more human, I joked that ‘wouldn’t it be funny if it contained an ammonite’. So I gave it a whack and there exposed was a perfectly preserved ammonite complete with some opalescent lustre. Relaxed indeed. I have it to this day and Kirk has steadfastly refused to ever collect with me. David, I think someone could compile a blog of these. And yes, I am familiar with how annoyed other people get when you pull out a fabulous specimen, when they have worked hard all morning and found nothing! I have the curse that if I toil away all day I find very little, but have this dumb luck as described, of finding stuff ‘at the last minute’ when I visit other people’s rock pile. Fortunately, I recently took on a student (Mack) who seems to have the best luck (or skill …) I have ever seen finding plant fossils. I watched him split a block of shale in BC about the size of a loaf of bread into slices ever thinner from a slice of ‘bread’ and finding a leaf or conifer shoot on every surface. Mack has the same luck with microfossils (spores and pollen) under the microscope. I only hope I can lure him back from his job in the oil industry to go to grad school! Years ago my family and I lived in Churchill. We found a very large trilobite and another ‘split rock’ (moulded on one piece and concave on another) of a very large worm looking fossil. The pieces were much too large to move but we did take the trilobite up to the Institute of Arctic Ecophysiology and left it there. This was an amazing find and now…I take a look at what we find a little more closely…some are ‘worthy’. Nice specimens here. Thank you for your comment, Teri. 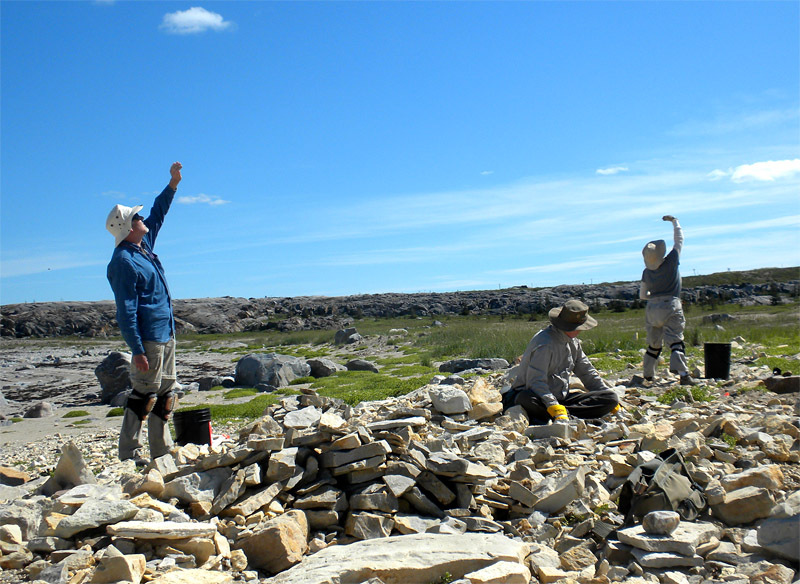 Yes, there are always more fossils to find around Churchill!